Did I do every thing correct? I have very limited funds so I am trying to stay away from purchasing heat bulbs and all that fancy stuff. All I have is a sun room with a heater in it and lots of sunlight that comes in. This year I have decided to attempt to grow catnip, asters, sweet peas and marigolds from seed. The flowers I planted yesterday so nothing is out yet but the cat nip I wanted to get your opinions on. I feel like im doing something wrong. I want to do my own seeds but cannot afford to buy/build all these set ups I see on this site. AM, that is a great room for plants! What direction does the larger windows face? The catnip seed looks like it's ready to go in some soil. If there is a problem there, I can only wonder about the coarseness of your soil. Are you top watering? I don't do that until the plants are really quite old and it just becomes too difficult & time consuming to get everything into a basin of water for a soak. I have a small greenhouse to grow things in but for the 1st few weeks, plants start out in a large south window. Before the greenhouses, I used a long, south window in a cool room. It worked great. Not sure what directions they face. I know we get sun in that side later in the day and sun first thing in the smaller windows. It is watered, I don't drench it. Keep in mind that the photos of "elaborate set-ups" that you may see here have been painstakingly added to year after year, piece by piece, at bargain-basement prices for the most part, by dedicated gardeners. I don't know of anyone who put a heat-mat, hanging-light, reflective-wall seed-starting set-up together in one season, not even on this website and certainly not in real life. Your "plant room" looks wonderful to me! 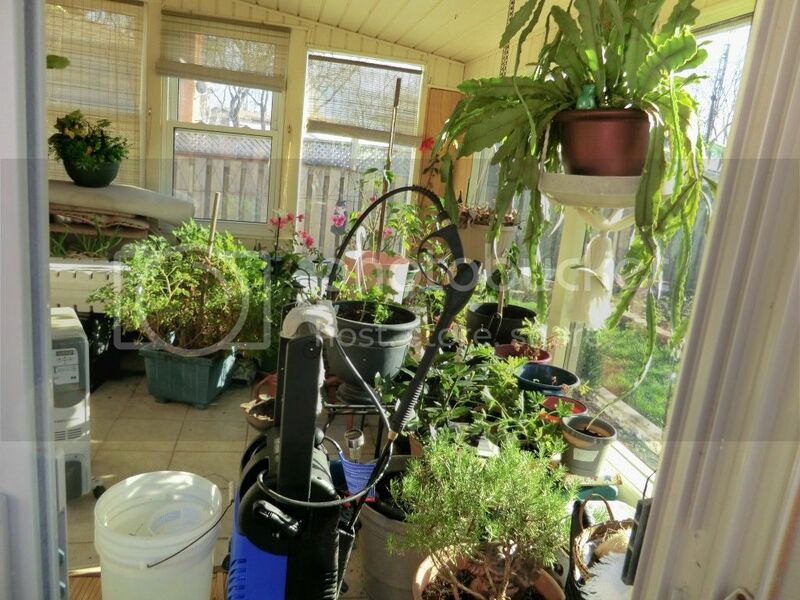 You probably have more growing space in that one room than many of our members have, period, whether indoors or out. It's all relative: growing space, growing season, varieties that will succeed, etc. Please don't feel that you're doomed because you can't put together *right now* some of the nice set-ups you've seen here. I'm sure that their owners would like to know that they've *inspired* you in your seed-starting endeavors rather than *discouraging* same. The one common thread that I've observed in our seed-starting members is that they start the seeds in very small containers, sometimes tiny cell packs. 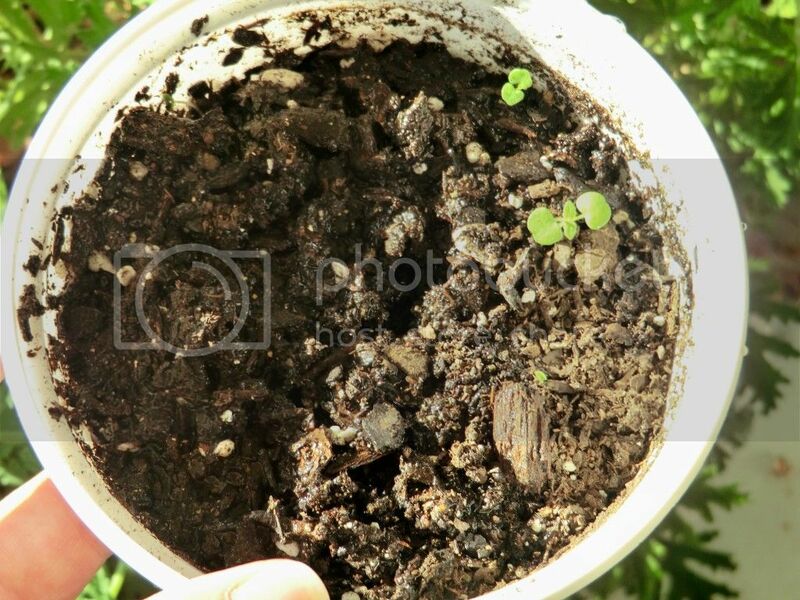 Then they move the tiny plants into 2-inch (5 cm) containers, then 3- or 3.5-inch (8 cm) containers. The point of the graduated changes is to encourage the young plant to develop a strong, dense root network at each stage of development before either transplanting it to its long-term container home or to the in-ground garden. This would be the place to dedicate what resources you can this year (and those "resources" might simply be the time needed to find free containers)--securing a sufficient number of the best-sized containers for the various stages of root development. There's a good thread hereabouts on low-cost/free creative container finding, and I've also seen small pots offered on my local Freecycle.org lists. What kind of soil are you using? It looks coarse and heavy. Your seeds really need something like potting soil, very light and loose. If I added up all the money that went into it, it would be a fair chunk, but I built it up over time, any given year I did not spend very much money. 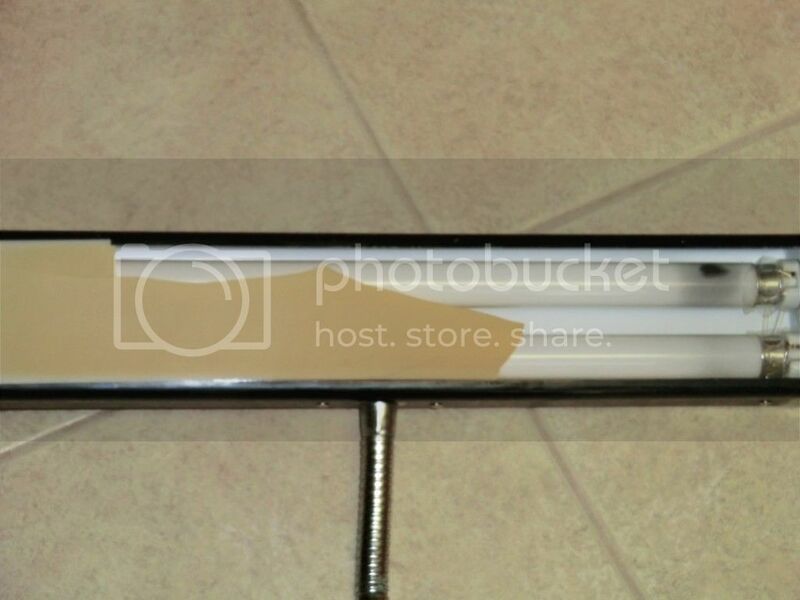 The individual components are pretty cheap, mainly shop light fixtures, with fluorescent tubes. It's cheap wire shelves and the bottom counter sits on top of old recycled kitchen cabinets. The only thing "fancy" about it is that there is a lot of it, two 8' long shelves, 8 shop light fixtures, 16 tubes. But like I said, I didn't go out and buy all that at once, I just kept gradually adding. The sprouts coming up in the round container in the second picture was the soil that came with the seeds (I ordered it online before I found seeds here). Any other container with seeds is potting mix. I tried to be cheap this year. I tried this wintersown method. You get these containers and poke holes in the bottom and some in the top. They are basically like mini greenhouses. For the most part they worked. Everything I started in them sprouted, however, the warm weather plants struggled. So I just went and bought a 4 foot shop light with some daylight bulbs. Since putting my peppers and tomatoes under this they have started to grow a lot better. I don't have that big of a garden. So if you are the same, you can get one shop light and only use it for the stuff that really needs it. I will do that wintersown method again but solely for cold weather plants. Warm weather stuff will go under the light. I have a Painters light. Not sure if thats any good? Is it like a tube light? Tube lights are good cause they cover more area. Also the bulb matters too. Daylight bulbs with a kelvin rating of 6500 are good cause they give the plants the colors they need to photosynthesize. I'm assuming by painters light, you mean one of those halogen lights?...wouldn't that be a bit expensive to run 16 hours a day? AM_16 wrote: Not sure what directions they face. I know we get sun in that side later in the day and sun first thing in the smaller windows. It is watered, I don't drench it. Overwatering didn't look likely - it was the disturbing of the soil surface that was of concern. At any stage of growth, there is the serious risk for me in there with a watering can or wand knocking the seedlings FLAT ! Well, when my Credit card payment goes through I can go see about some kind of light. If its in expensive (expensive to me is over $100) then I can grab it. Its cloudy today and no one is getting any sun . Tomorrow is suppose to be really nice out so ill invade the windows. I have a system going outside. I rotate the plants that really need sun so each one gets about 6-10 hours of light a day when the sun is out. Plus on warmer days when its above 13-15 degrees (that would be t shirt weather) I put them outside for a bit. Okay, I found something out I had no idea of. 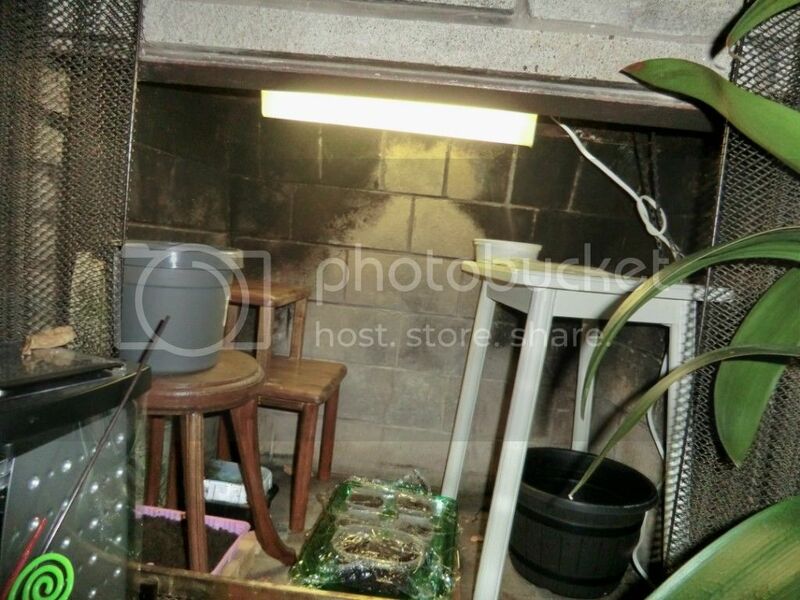 My grandmother upstairs told me in the fire place she had sealed she has a grow light or florescent (she cant remember). She installed it when she had real plants under there. Timer was set to go on when the power was cheap and that is 7pm till 7am. So she was kind enough to move her fake plants out of there so I could use it for my seeds/sprouts. Is this okay and does anyone have any suggestions? I have tomato seeds that I planted in a flat today under the table in the bottom left side (pink tray), then I have my sprouted catnip on the top in the white container and in the zip lock baggie (those are starting to sprout). In the one under the white table is freshly planted catnip seeds as well as the other pot on top of the table to the left. On the floor covered in saran wrap are marigold, sweet pea and..more catnip. I also have more marigold, sweet peas and asters planted outside in the sun room in pots. The reason for so much cat nip is my cat loves it and I want to try it in my tea. Also I don't think all the seeds I planted will take so I wanted to be safe them sorry so I planted tons. AM_16, I don't grow under lights most years. 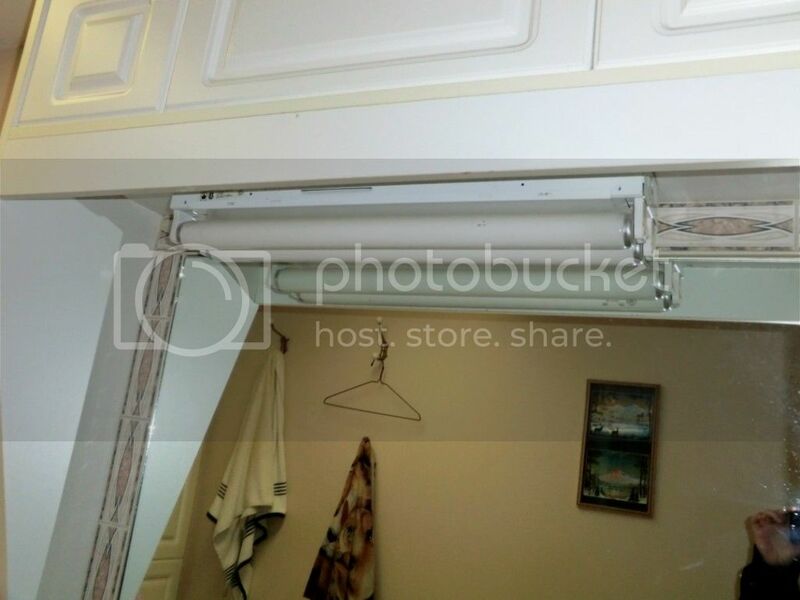 I have an 8' fixture with double fluorescent tubes. Actually, I have more than 1 but have only set up one at time and . . . not for the last few years. I think that your grandmother's light is the same type. 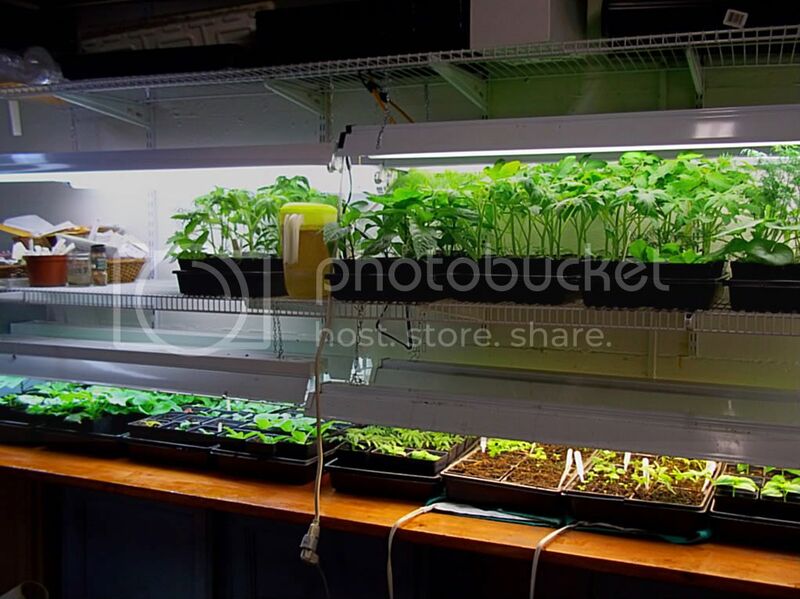 With those kind of lights, you must keep the plants very close to the light source - only a few inches. Best sun/shade % for various vegetables - what's correct? 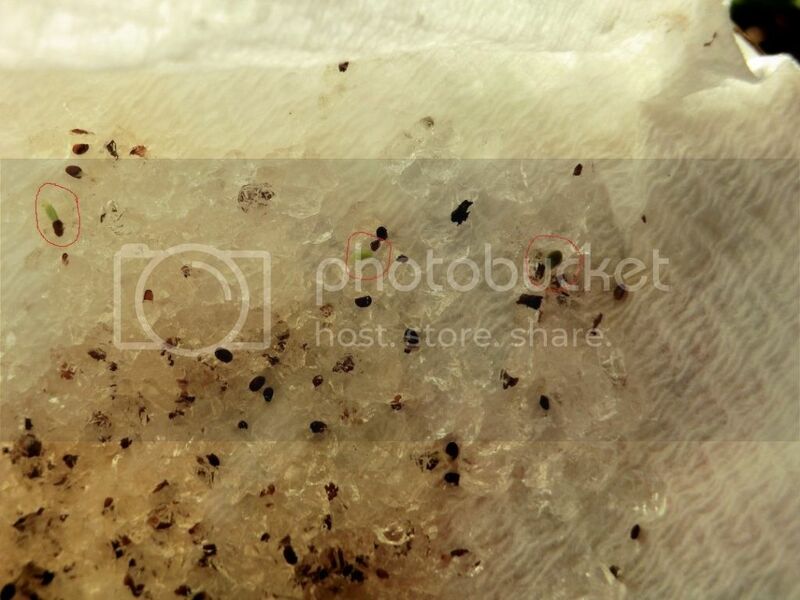 Accidentally Put Aglime on Tomatoes - How do I Correct it?